The use of standardised test methods enables thermal decomposition products of a Heat Transfer Fluid (HTF) to be quantified accurately. For test results to be meaningful (ie predictive), however, it is important to gain a representative HTF sample, which is done whilst the HTF is hot and circulating in the heat transfer system. It is good practice to take representative HTF samples on a regular basis (as frequently as is feasibly possible) and to monitor the decomposition of a HTF over time to reduce the potential of finding false negative or false positive results (read more about this in a previous article). Safe sampling and handling of a HTF needs to be conducted to the highest standards and engineers need to adhere to safety regulations as a minimum and conducted according to defined risk and methods statements. This includes wearing the correct Personal Protective Equipment (PPE). Indeed, this also needs to be done by experienced engineers, using correct sampling devices and equipment so that a representative sample can be obtained safely while the plant is still in operation. Managing fluids at high temperatures (to comply with regulations) presents a safety hazard especially if done whilst the Heat Transfer Fluid (HTF) is in operation. Therefore, the personal protective equipment (PPE) worn by engineers is extremely important for health and safety. PPE is defined as any equipment that offers protection against hazards and is there to protect personal health and safety at work. The PPE that should be considered by engineers taking a high temperature sample are outlined in this article. Potential eye hazards are the first thing that must be considered. Risks can include splashing of hot fluids and chemicals, as well as exposure to dust and gas. Best practice dictates that prior to entering a hazardous environment an engineer should put on safety spectacles. Spectacles are covered by a facemask to protect the eyes against any adverse vapours or splashes. The mask also protects the wearer’s skin and offers further protection when sampling HTFs. Ear defenders should be worn to protect hearing. On entering any facility, all relevant staff should wear a hard hat to prevent any form of head injury. This includes bumping the head on stationary objects, hair entanglement or impact from falling/flying objects. 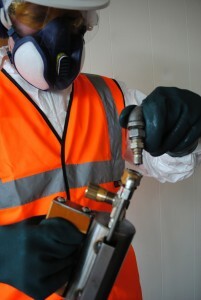 An engineer’s uniform should include a disposable filtering face piece or respirator (half or full-face), an air-fed helmet, and breathing apparatus. Global Heat Transfer’s engineers wear 3M respirators, which work to filter fumes from the HTF being sampled. Engineers should also consider wearing disposable coveralls and high-visibility clothing. Hazards to hands and arms include abrasion, temperature extremes, cuts, and contact/contamination with chemicals. When taking a live HTF sample it’s recommended that heat-rated gauntlets are worn. These need to be non-porous so that they are resistant to the fluid penetrating the gauntlet. A cotton inner glove is also recommended as this serves as an additional layer against the gauntlet should it come into contact with a live thermal fluid. Furthermore, the cotton glove helps to stop moisture from pooling in the gauntlet. Much like hands and arms, the feet and legs also need protection from safety risks such as chemical splashes and falling objects. Therefore, wearing tight-fitting boots is recommended. These need to provide some heat resistance and must have a non-slip sole. Boots should also have a steel toecap to protect the toes, and penetration-resistant mid-soles. A HTF sample should only be taken by a trained qualified professional and by a reputable company to ensure the safety of the engineer taking the sample and the safety of the overall plant. When choosing a company it is important to identify one with experience, and this can be checked by asking for company references. It is also possible to audit the company to inspect safety records as well as staff training records. The objective of this is to identify the number and extent of past accidents to staff and customer sites and to also check that the company is properly training its staff. Lastly, before an engineer samples a fluid, it is imperative that they familiarise themselves with the fluid as well as its composition. This is done by referring to the safety data sheet for the material(s) they will be handling. Global Heat Transfer engineers are trained and experienced professionals in drawing representative samples and interpreting results to maximise heat transfer fluid longevity and ensure a safe system, site and workforce. Disclaimer: This article is provided for guidance alone. Best practice is to ensure that only trained experts take live, hot, circulating samples. High temperature heat transfer fluids degrade when used at high temperature for prolonged periods, so what can be done to slow this process?